Beautiful necklace. Elegant, yet unique; however, clasp on back can get itchy on your neck. 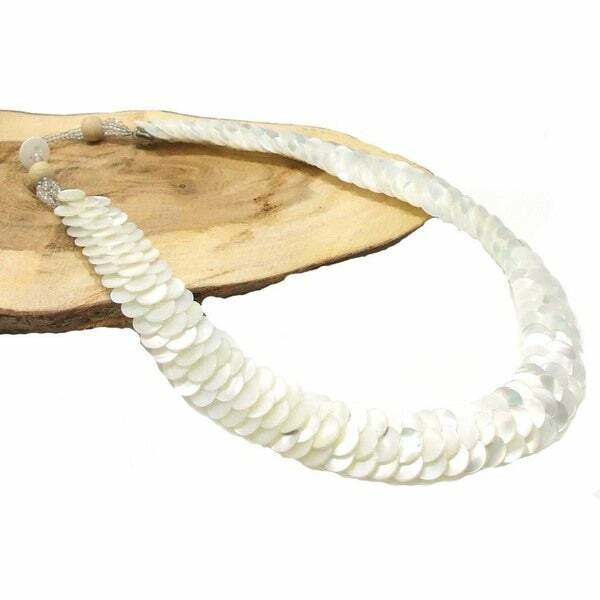 Mystical white troca shells exudes pure beauty in this necklace from the Philippines. Crafted by hand, this necklace adds elegance to your style. Brian and Bella are siblings who love to design jewelry and handicrafts. They began learning their trade at a young age from their mother. Living in the Philippines, they are never far from the sandy beaches and the dynamic ocean, where they draw most of their inspirations. The pair enjoy fusing modern design principles with local and native material found in the islands such as shells, wood, and stones. To honor their mother, the pair decided to name the store after her, Cherie. All weights and measurements are approximate and may vary slightly from the listed information. Treatment code N (trocal shells). See Treatment Guide for further information. I purchased the necklace because of my need for white jewelry and it's neat layered look. I am so pleased with it and the look it conveys. I am older; so I am conscious of anything that could draw attention to that fact! But this necklace lays so 'quietly' on one's neck that it is outstandingly elegant. I am pleased with it and the matching bracelet. This was a gift. The person I gave this to lost her breath for a minute. She was absolutely speechless because this was so beautiful. She was also amazed at the intricate workmanship, as I was. A lot of time and effort went into making this beautiful necklace. This necklace is very flattering to almost any outfit. Well made and lovely. Looks great on. Looked like something made by kindergarten kids while eating. The clasp was rubber thread. So horrible I couldnt put it on. I returned it and the earrings immediately. "On the Troca Seashells necklace and it be lengthen buy an additional piece of chain ? I only need 2 inchea." Hello patsy73, unfortunately we do not offer an extension for this necklace. Thank you for shopping with us!